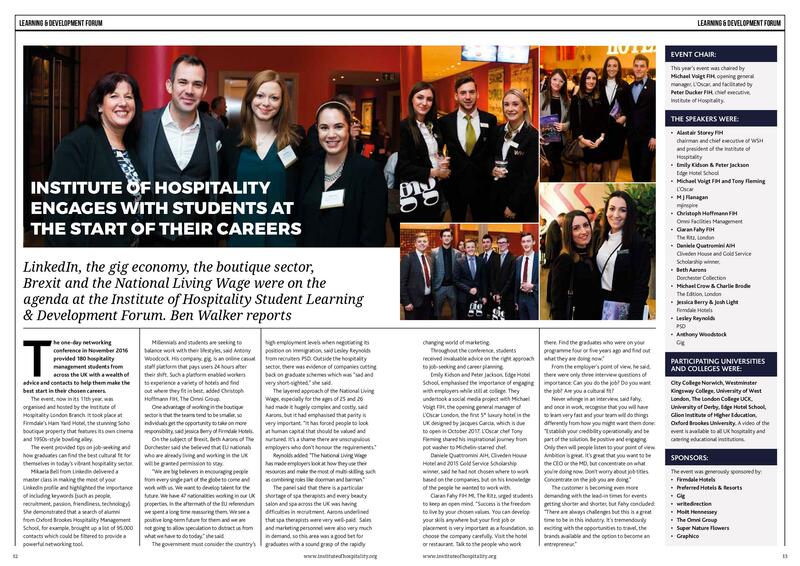 LinkedIn, the gig economy, the boutique sector, Brexit and the National Living Wage were on the agenda at the Institute of Hospitality Student Learning & Development Forum. Ben Walker reports. The one-day networking conference in November 2016 provided 180 hospitality management students from across the UK with a wealth of advice and contacts to help them make the best start in their chosen careers. The event, now in its 11th year, was organised and hosted by the Institute of Hospitality London Branch. It took place at Firmdale’s Ham Yard Hotel, the stunning Soho boutique property that features its own cinema and 1950s-style bowling alley. The event provided tips on job-seeking and how graduates can find the best cultural fit for themselves in today’s vibrant hospitality sector. Mikaela Bell from LinkedIn delivered a master class in making the most of your LinkedIn profile and highlighted the importance of including keywords (such as people, recruitment, passion, friendliness, technology). She demonstrated that a search of alumni from Oxford Brookes Hospitality Management School, for example, brought up a list of 95,000 contacts which could be filtered to provide a powerful networking tool. Millennials and students are seeking to balance work with their lifestyles, said Antony Woodcock. His company, gig, is an online casual staff platform that pays users 24 hours after their shift. Such a platform enabled workers to experience a variety of hotels and find out where they fit in best, added Christoph Hoffmann FIH, The Omni Group. One advantage of working in the boutique sector is that the teams tend to be smaller, so individuals get the opportunity to take on more responsibility, said Jessica Berry of Firmdale Hotels. On the subject of Brexit, Beth Aarons of The Dorchester said she believed that EU nationals who are already living and working in the UK will be granted permission to stay. “We are big believers in encouraging people from every single part of the globe to come and work with us. We want to develop talent for the future. We have 47 nationalities working in our UK properties. In the aftermath of the EU referendum we spent a long time reassuring them. We see a positive long-term future for them and we are not going to allow speculation to distract us from what we have to do today,” she said. The government must consider the country’s high employment levels when negotiating its position on immigration, said Lesley Reynolds from recruiters PSD. Outside the hospitality sector, there was evidence of companies cutting back on graduate schemes which was “sad and very short-sighted,” she said. The layered approach of the National Living Wage, especially for the ages of 25 and 26 had made it hugely complex and costly, said Aarons, but it had emphasised that parity is very important. “It has forced people to look at human capital that should be valued and nurtured. It’s a shame there are unscrupulous employers who don’t honour the requirements.” Reynolds added: “The National Living Wage has made employers look at how they use their resources and make the most of multi-skilling, such as combining roles like doorman and barman.” The panel said that there is a particular shortage of spa therapists and every beauty salon and spa across the UK was having difficulties in recruitment. Aarons underlined that spa therapists were very well-paid. Sales and marketing personnel were also very much in demand, so this area was a good bet for graduates with a sound grasp of the rapidly changing world of marketing. Throughout the conference, students received invaluable advice on the right approach to job-seeking and career planning. Emily Kidson and Peter Jackson, Edge Hotel School, emphasised the importance of engaging with employers while still at college. 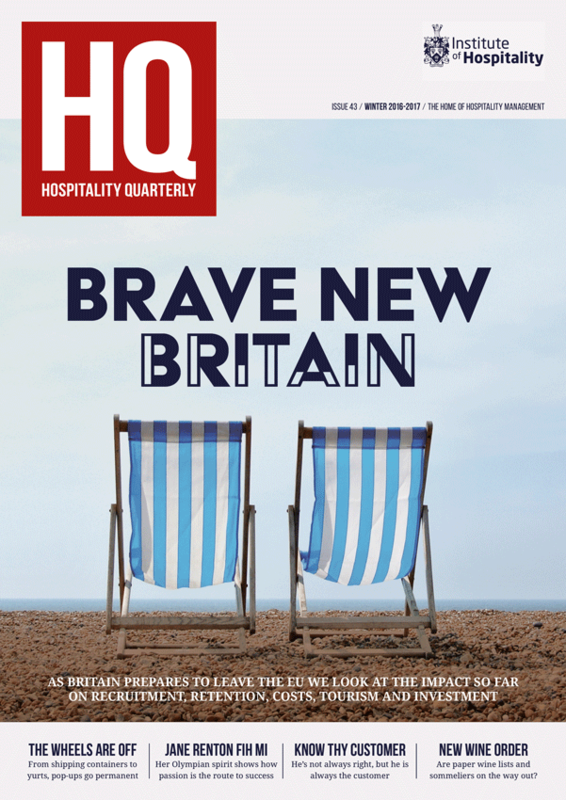 They undertook a social media project with Michael Voigt FIH, the opening general manager of L’Oscar London, the first 5* luxury hotel in the UK designed by Jacques Garcia, which is due to open in October 2017. L’Oscar chef Tony Fleming shared his inspirational journey from pot washer to Michelin-starred chef. Daniele Quattromini AIH, Cliveden House Hotel and 2015 Gold Service Scholarship winner, said he had not chosen where to work based on the companies, but on his knowledge of the people he wanted to work with.